Beirut (AFP) – A string of suicide blasts and raids claimed by the Islamic State group killed more than 220 people in southern Syria on Wednesday, in one of the jihadists’ deadliest ever assaults in the country. The bloodshed came almost a week into a Russia-backed regime campaign to oust IS fighters from a holdout in a neighbouring province of the country’s south. IS claimed responsibility for the violence, saying “soldiers of the caliphate” attacked Syrian government positions and security outposts in Sweida city, then detonated explosive belts. At least 221 people were killed, including 127 civilians, the Observatory said. The remaining 94 dead were pro-regime fighters, mostly residents who took up arms to defend their homes, it said. 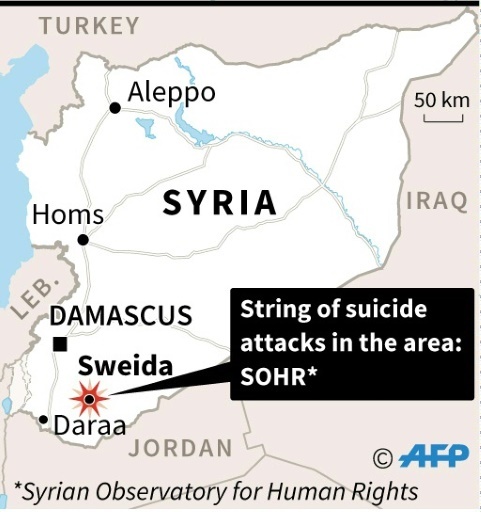 The overwhelming majority of the dead “were in (Sweida’s) northern countryside, where the bodies of civilians executed inside their homes were found,” Observatory head Rami Abdel Rahman told AFP. “It’s the bloodiest death toll in Sweida province since the start of the war” and one of the deadliest ever IS attacks in Syria, the Observatory chief said. AFP / AFP. Map of Syria locating Sweida. “Some residents who fled the attacks on their villages are returning and finding people dead in their homes,” Abdel Rahman said. “Today’s crime shows that countries supporting terrorism are trying to breathe life back into the terrorist organisation to keep it as a card in their hand that they will use to achieve political gains,” Syrian President Bashar al-Assad as he received Russia’s envoy to Syria Alexander Lavrentiev. “These attempts will only succeed in… shedding more innocent blood,” he added, in comments carried on his social media accounts. Omar, a resident of Sweida city, told AFP explosions began rocking the city around 5:30 am local time (0230 GMT). “The blast was sudden and unexpected. Never in its history has Sweida seen such a tough day,” he told AFP. Abandoned shoes lay in the middle of the road among fruit that had spilt out of cartons. An eyewitness said Sweida’s national hospital was “packed”. He said he saw “people bringing in a lot of wounded in their own private cars.. Others were coming to the hospital to ask if loved ones they had lost track of were there”. The UN’s humanitarian coordinator in Syria Ali al-Zaatari condemned the “terrorist bombing in Sweida city”, saying all civilians should be protected. Government ally Russia said the IS attacks “confirm the need for energetic and coordinated efforts by the international community to eradicate this universal evil from Syrian territory”. AFP / DELIL SOULEIMAN. 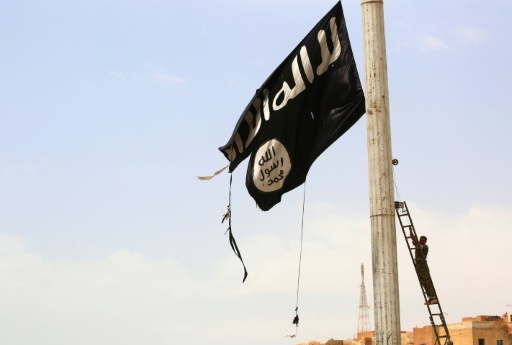 A member of the US-backed Syrian Democratic Forces (SDF) removes an Islamic State group flag in the Syrian town of Tabqa, about 55 kilometres (35 miles) west of Raqa city, on April 30, 2017. Pro-government forces ousted IS from urban centres in eastern Syria last year, but IS raids in recent months have killed dozens of regime and allied fighters. After ousting mainstream rebels from most of the south, Assad’s troops backed by his Russian allies are now closing in on the IS pocket in Daraa. SANA said the attacks on Sweida were an attempt to relieve pressure “on IS remnants facing their inevitable end in the western Daraa countryside”. AFP / JALAA MAREY. A picture taken on July 24, 2018 from the Tal Saki hill in the Israeli-annexed Golan Heights shows smoke rising across the border in Syria during air strikes as regime forces pressed an offensive against Daraa province. 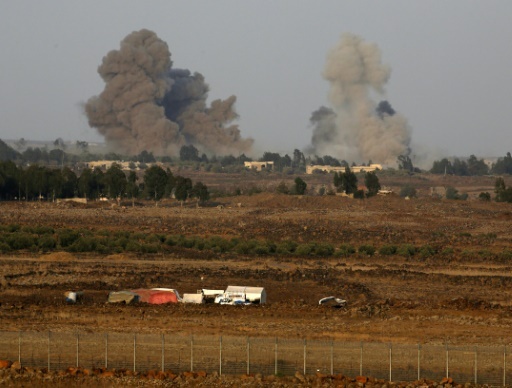 Israel’s army on Tuesday said it had shot down a Syrian fighter jet that had infiltrated Israeli airspace, risking another escalation around the sensitive buffer zone. 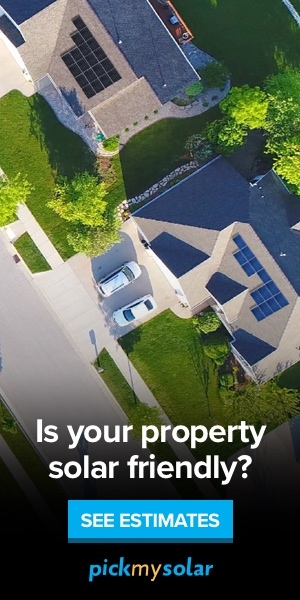 Featured Photo: SANA/AFP / Handout. 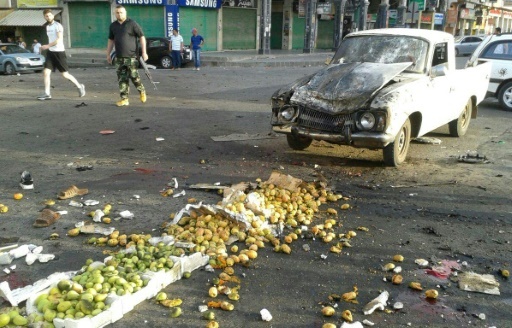 A handout picture released by the official Syrian Arab News Agency (SANA) on July 25, 2018 shows a member of the Syrian security forces walking past a truck damaged in a suicide attack in the southern city of Sweida.